Various news sources and Twitter have reported that the huge storms, which have hit many regions in France, have caused serious damage to grape crops in the Vouvray region. Two hail storms hit the town of Tours on Monday morning, with reports that some of the hail stones were the size of eggs. 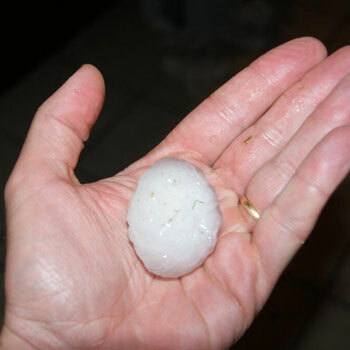 One person posted a photograph on Twitter, holding one of the large hail stones (pictured left). Emergency services received more than 200 calls, but for the second year running it looks like the weather has done some serious damage to vineyard crops. Christian Feray, winemaker Castle Montcontour, told AFP: “This is a disaster, the storm lasted about 10 minutes and all chopped. On Vouvray and Reugny, vineyards are 100% destroyed. These strong winds increased the damage caused by the hail on the vineyards. Philippe Thierry, the director of the cellar of Vouvray wine growers, told local newspaper France Bleu Touraine that the storm was a disaster and there was a lot of hail. Thierry added that he is now concerned about the economy and the future for many winemakers, after last year some of the producers lost up to 50% of their harvest. He added that this storm could lead to financial problems for the winemakers and they won’t be able to produce enough wine for the market.